(New York, NY and Beijing, China, March 9, 2015) – Valiant Entertainment – the award-winning comic book publisher with a library of more than 2,000 characters, including X-O Manowar, Bloodshot, Harbinger, Shadowman, Archer & Armstrong, and more – and DMG Entertainment, the Beijing-based leader in global entertainment, today announced a new partnership to span motion pictures, television, publishing, and licensing that will culminate in the big screen debut of Valiant’s universe of characters in theaters around the world. In conjunction with this new partnership, DMG has made an eight-figure (USD) series C round of equity investment into Valiant, which the company will use to further its efforts in international publishing, film, television, licensing and beyond. DMG has dedicated an additional nine-figures (USD) of film financing capital toward the production of theatrical films and television programs based on Valiant’s library of iconic superhero characters. In total, the new agreement is the first deal of its kind brokered between an internationally based entertainment company and a leading independent publisher of comic books and graphic novels. Utilizing DMG’s expertise in international film development, production, and distribution, Valiant will begin to establish its cinematic universe in the United States, China and beyond. 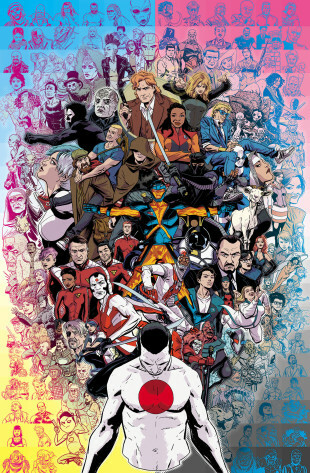 Current Valiant feature films in development include the previously announced BLOODSHOT from Sony Pictures in partnership with Original Film; SHADOWMAN in partnership with the Sean Daniel Company from a script by J. Michael Straczynski; and ARCHER & ARMSTRONG, also with the Sean Daniel Company from a script by BenDavid Grabinski; among others. Valiant has also already begun development on several television projects. The unprecedented partnership between Valiant and DMG offers both companies the ability to develop and co-produce tent-pole theatrical films for distribution and release simultaneously in the United States, China – the world’s fastest growing film market with more than $4.8 billion in box office receipts in 2014 – and the rest of the world. Beyond film alone, DMG and Valiant will work in concert to form China-focused licensing partnerships for Valiant’s stable of characters in areas such as Chinese language publishing, animation, online gaming, toys, apparel, live events, theme parks, and more, with a focus on bringing Valiant’s iconic heroes to new audiences in China and Asia-Pacific. DMG Entertainment has a proven track record of introducing celebrated superheroes to the Chinese/international marketplace. In 2013, the Beijing-based studio and production company co-produced and co-financed Marvel Studios’ IRON MAN 3 – the highest grossing foreign film of 2013 and sixth highest of all time in China­. DMG is currently co-producing high-octane thriller AUTOBAHN, starring Anthony Hopkins, Ben Kingsley, Felicity Jones and Nicholas Hoult; and the extreme actioner POINT BREAK, directed by Ericson Core; both films will hit screens worldwide in 2015. Celebrating its 25th anniversary in 2015, Valiant is one of the most successful comic book publishing companies in the history of the medium with more than 81 million comics sold and a library of more than 2,000 distinct characters. Established by a brain trust of legendary comics creators – including former Marvel Editor-in-Chief Jim Shooter; seminal Iron Man writer and artist, Bob Layton; and the visionary writer and illustrator of Wolverine: Weapon X, Barry Windsor-Smith – Valiant’s heroes and villains inhabit the largest independently owned superhero universe anywhere in comics. Re-established in 2005 as Valiant Entertainment with a best-in-class management team that includes Chairman Peter Cuneo, CEO & Chief Creative Officer Dinesh Shamdasani, COO & CFO Gavin Cuneo, President of Licensing, Promotions & Ad Sales Russell A. Brown, Publisher Fred Pierce and Vice Chairman Jason Kothari, the company returned to great commercial and critical success in 2012, winning a Diamond Gem Award for Publisher of the Year and numerous industry awards and accolades. To date, Valiant’s titles consistently rate among the best reviewed in comics. DMG is a global entertainment and media company with diverse international holdings across motion pictures, television, music, gaming, creative management and entertainment-themed properties, as well as offering advertising, marketing and brand communications services. DMG Entertainment, the company’s entertainment division, makes movies and television shows, along with music promotion, licensing and merchandising, cinemas and gaming with a focus on telling stories that appeal to global audiences with operations in North America/Hollywood and Asia/China. DMG Entertainment’s films include the record-setting blockbuster IRON MAN 3, the critically acclaimed sci-fi hit LOOPER, and the techno-thriller TRANSCENDENCE; along with some of China’s highest-grossing films including NO MAN’S LAND, FOUNDING OF A REPUBLIC and GO LALA GO!. DMG Entertainment is currently working on the high-speed thriller AUTOBAHN, starring Anthony Hopkins, Ben Kingsley and Nicholas Hoult; and Point Break, directed by Ericson Core, for release in 2015. DMG Entertainment China [SHZ: 002143] publicly traded on the Shenzhen stock exchange. Valiant is a leading character-based entertainment company with a library of over 2,000 characters, including X-O Manowar, Bloodshot, Harbinger, Shadowman, Archer & Armstrong and many more. Established in 1989, Valiant has sold over 81 million comic books, and today its characters continue to be forged in publishing, licensing, film, video games, and beyond. Since its summer 2012 relaunch, Valiant has returned to the fore as one of the most highly regarded publishers in comics, winning a 2012 Diamond Gem Award for Comic Book Publisher of the Year. Visit them online at ValiantUniverse.com. “DMG is a force in China. This partnership will bring Valiant’s iconic characters to the Chinese marketplace in a fashion unprecedented in the world of superheroes and comics to date. DMG will introduce Valiant’s universe to Chinese audiences and, in the process, enhance the appeal and relevance of our characters to the fastest growing marketplace for entertainment in the world,” said Gavin Cuneo, COO & CFO for Valiant Entertainment.